From small, compact virtual floors to grids covering thousands of square metres. Since its launch in 1997 over a hundred Cablenet installations have been completed. Modular, ModularPlus+ and Custom ranges for maximum flexibility. From initial calculations to design, construction and installation of steelwork & wire rope. 36 miles of steel cabling and 75 tonnes of steel, the world's largest Cablenet. A doughnut shaped Cablenet, integrating with a complex array of existing steelwork. A circular installation, doughnut shaped with no intermediate supports. Five Cablenets saddle mounted onto original timber beams in this old Baptist Chapel. A 15 x 8m containment frame installed on the first floor of a Georgian villa. This grid covers 20 metres by 15.5 metres, installed using 5 frames. the 1,066 capacity Grand Hall. 23 x 9.5m and following the shape of the ceiling, this was the first tension wire grid in Sweden. Installed at Madrid's largest exhibition centre, this is the world's 2nd largest grid. With no intermediate members below the grid, it's completely clear to the venue floor. Three independently pivoting panels that tilt to a vertical position over the stage area. A tapered rectangular tension wire grid with an overall size of 10 x 5 metres. Two Cablenets, one over the stage and one covering the orchestra pit and auditorium. This grid measures 11.1 x 8m and is secured at 5.5m off the ground. A custom designed 8 x 8m frame, square at the stage end with a curve at the auditorium end.. This simple, modular Cablenet consists of six square frames and one rectangular frame. A uniquely shaped tension wire grid with access via cat ladder. This tension wire grid comprises an 8m diameter circular frame with integral sub-frame. 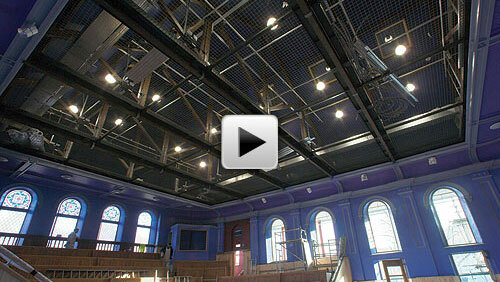 A modular Cablenet tension wire grid installed over the auditorium and stage. Installed to a specific area over an orchestra pit to act as a safety structure. Wire rope, safety bonds, rigging screws, hooks, shackles, thimbles, grips & more. Raise and lower suspension bars safely, quickly and easily. Simplify rigging procedures for critical acrobatic applications. Cablenet tension wire grids are strong, safe and virtually invisible access platforms used in theatres, studios and concert halls. A Cablenet tension wire grid platform creates a permanent, high level and completely safe ‘virtual floor®’ on which maintenance staff and engineers can work in complete confidence. This innovative high level platform, eliminates the need for fixed position walkways, technical galleries or scaffold towers. Virtually invisible from ground level, a Cablenet virtual floor® casts no shadow from stage lighting positioned above. Find out more about Cablenet tension wire grids. Come walk the wire with us! Immerse yourself in our most recent tension wire grid installation. Use your finger or mouse to move left, right, up and down at one of our latest tension wire grid installations, and get a feel for what it's like to walk the Cablenet tension wire grid in this this 360 degree interactive presentation! From new-build exhibition halls to listed buildings, including the world's two largest tension wire grids. See the benefits of Cablenet in action. Go to our videos page to see short movies of our installations. Download Cablenet brochure PDF, iPod videos, or a copy of our Powerpoint presentation. © Copyright 2012 Slingco. All rights reserved.